Despite its reputation for being a sterile city only worthy of a quick stopover, Singapore has cleverly reinvented itself into a culinary destination in its own right. From boutique coffee bars and roasters to world-class bars and restaurants, Singapore definitely warrants a longer stay to fully immerse yourself into the city’s culture. Here’s my guide for where to eat and drink in this great city. For the ultimate fine dining experience, head to Andre Chiang’s Restaurant Andre in Singapore’s China Town, a restaurant which continues to lead the way in the city’s burgeoning dining scene. A regular in the World’s 50 Best Restaurants, Restaurant Andre is famous for its contemporary take on Southern French cuisine with a touch of Mediterranean flavours. Born in Taiwan, Chiang’s dishes are made up of the eight elements of his Octo-philosophy: pure, salt, artisan, south, texture, unique, memory and terroir. The ‘memory’ dish has been there from the start consisting of a warmed foie gras jelly with black truffle coulis. Be prepared to book well in advance with the challenging booking system, and, be warned, it doesn’t come cheap. Another restaurant which is always at the top of the eat list in Singapore is Waku Ghin by Chef Tetsuya Wakuda. This is degustation at its best with a magical journey including signatures like the Marinated Botan Shrimp with Sea Urchin and Caviar and Wagyu with Wasabi and Citrus Soy. Diners are treated to an intimate restaurant experience in the comfort of their own private room, each with a private chef delivering the degustation menu. The bar also deserves a visit too, where you can experience premium sakes in a a beautiful lounge setting. Did I mention the views from the Marina Bay Sands resort are equally spectacular? If a glammed up barbeque is more your scene, add Burnt Ends to the top of your food bucket list.Burnt Ends serves up an Aussie style modern barbeque of epic proportions in a casual dining setting overlooking the heart of the action in the open kitchen. Smoking, slow roasting, hot roasting, baking, grilling and cooking directly on coals are all techniques used at Chef Dave Pynt’s 4 tonne, dual cavity wood burning machines and custom built grills. The menu is written daily, and you an expect mouth watering dishes like succulent pulled pork shoulder with slaw and chipotle mayonaise and smoked quail eggs and crispy salmon skin. I’m getting hungry just thinking about it. 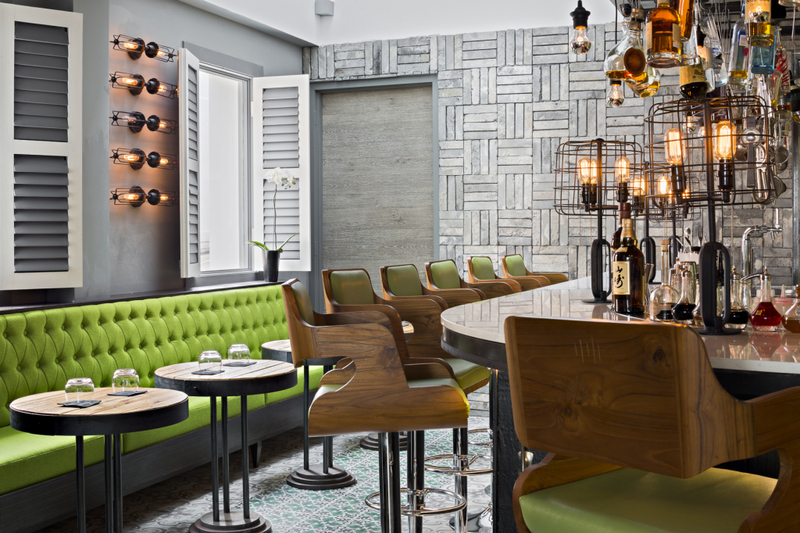 Inspired by tapas bars found in Spain, Jason Atherton’s Esquina serves modern Spanish tapas in a cosy setting in Chinatown. The menu is neatly divided into four small sections; snacks, soil, sea and land.From the sea menu, a salted cod “Alkorta” is a standout paired with 28 iberico and tomato chickpeas, while you can’t beat the Iberico pork and foie gras burgers on the land section. The food is good here, but the servings sizes are quite small, especially considering how cheap pintxos bars were on my last visit to San Sebastian. Other places worth checking out are David Thompson’s Long Chim, award winning Les Amis for gorgeous French cuisine (keep an eye out for their affordable lunch specials) and Saveur for the cheapest French dining you’ll find in Singapore. Despite its reputation for its pristine streets and almost sterile cleanliness, Singapore isn’t just a pretty face. Delve deep beneath the surface of this picture perfect city and you’ll find a great range of cocktail and speakeasy bars. Be warned the drinks here don’t come cheap, and keep an eye out for heavily taxed wine prices. Although The Library is Singapore’s worst kept secret, it is still one of the hottest speakeasies around town. Venture behind the hidden façade of bookshelves and mirrored walls and you’ll soon discover an incredibly moody, dimly lit bar full of atmosphere and charm. Come here thirsty – their expert bar staff will whip you up a perfectly crafted cocktail in no time, equipped with their own bar prop and story. Entry is by password. A handy hint – check out their social media pages or ask nicely at their sister restaurant, The Study, next door. Or do what I did and rock up unaware and shamelessly sing your favourite song to the door girl. Operation Dagger may be hard to find, but it’s sure as hell worth the journey. Look for the glass door marked with a strange phantom like symbol at a fairly non-descript building on Ann Siang Hill and you’ll find this hidden gem. A dingy stairwell leads into one of Singapore’s hottest drinking dens. It may be tiny, but it makes up for it with personality. There’s an impressive bulb light cloud installation and walls full of brown bottles which gives it an old-fashioned apocethary kind of feel. The cocktail menu itself is quite small, focusing on experimental cocktails based on your drink preferences. Trust me, it’s difficult to stop at one. 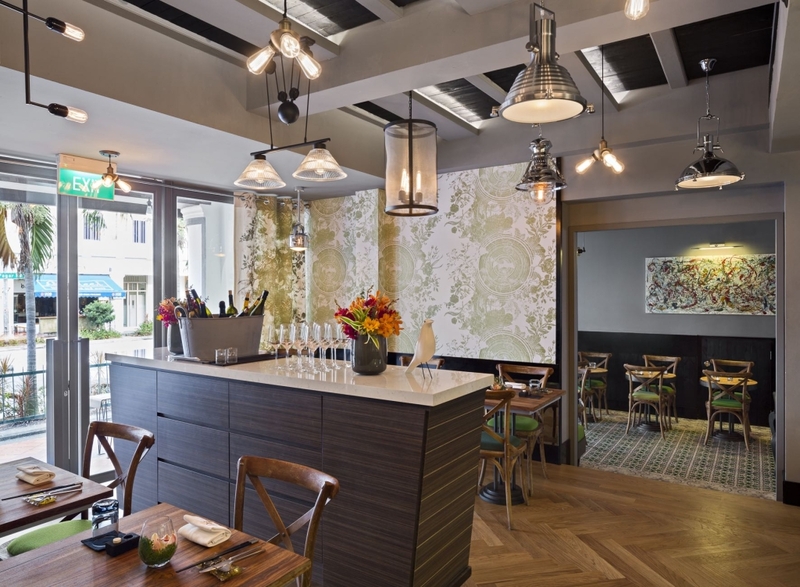 The award-winning Tippling Club restaurant and bar has recently moved to a new neighbourhood on the fringe of the CBD, after five successful years at its Dempsey Hill location. Housed in the heart of Tanjong Pagar Roar the cocktail bar, which also doubles as a fine dining restaurant, is the perfect spot for a pre-dinner apertivo or a nightcap. Using a flavour spectrum of sweet, sour, fruit and smoky cocktails, the menu is cleverly thought out. For something on the sweet side try the PB + J with peanut butter, cassis, orange, marshmallow and granola, or for something on the dry side the pink peppercorn negroni will go down a treat. Internationally celebrated as one of the world’s best bars, 28 Hong Kong Street was one of the early pioneers of Singapore’s cocktail movement since opening in 2011. Inspired by a New York prohibition style speakeasy, 28 Hong Kong Street is hidden behind an unassuming 1960’s shophouse façade on Singapore’s HongKong Street and is a word of mouth kind of place. The drinks list is superb, taking patrons through the 19th Century to the modern era with a distinct focus on artisanal spirits and American style craft cocktails. The food is gussied up American comfort food made from scratch for sharing. Reservations are recommended. For a longer list of bars check out my Best Bars in Singapore feature. 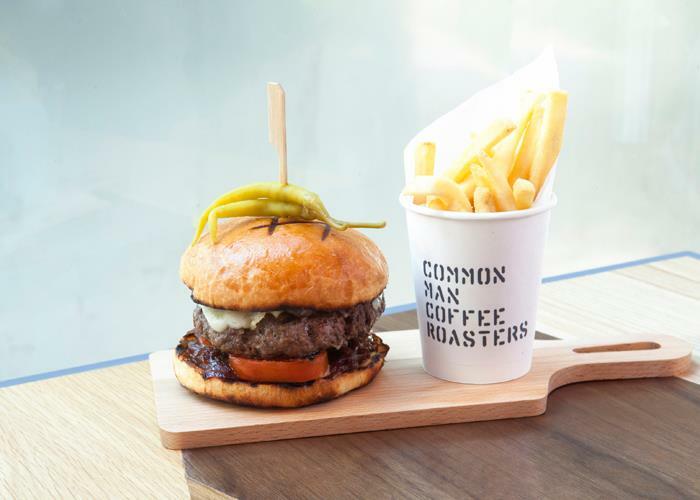 Common Man Coffee Roasters on Martin Road is a crowd favourite for budding coffee aficanados. They source the finest coffee beans around, depending on what’s freshest and in season.Don’t miss their cold brew – perfect on a hot day! They also conduct weekly cupping sessions for budding coffee connoisseurs. Or if you want to brew your own at home, beans are also sold at the café. One of the early pioneers of the coffee movement is 40 Hands which was one of the first coffee bars in Singapore to offer a taste of Third Wave Coffee. 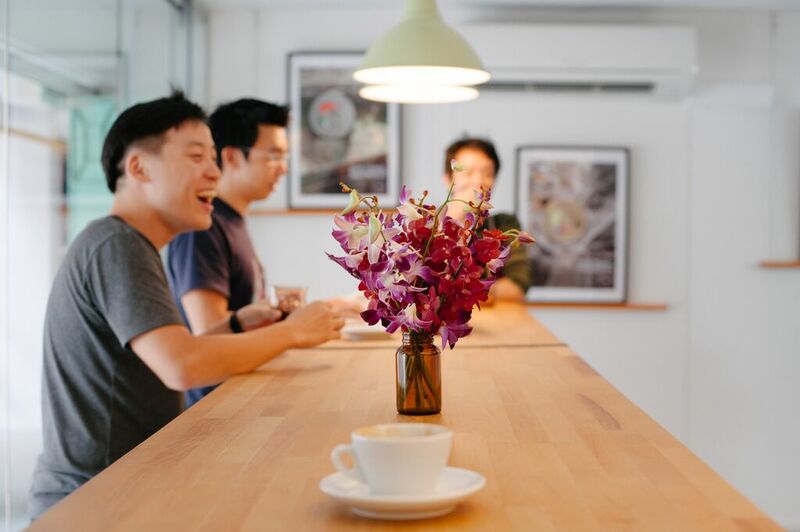 40 Hands aim to elevate the status of coffee appreciation in Singapore, promote sustainability and offer delicious specialty coffee from super fresh beans. Why 40 hands? According to them it takes 40 hands to produce a single cup of coffee from bean to cup. For more coffee bars in Singapore check out my feature about the Best Coffee Bars in Singapore. A good old Aussie style brunch can be difficult to find in Singapore but with specialist coffee joints popping up by the dozens there has been an influx of better brunch options. Not only does Common Man Coffee Roasters serve up a top notch brew, they are also famous for their quality brunch options. The all-day breakfast menu is full of delicious goodies like the brioche French toast stacked with berry compote, maple syrup and vanilla ice cream or the gut wrenching full breakfast with all the trimmings. The atmosphere is casual and relaxed, perfect for a mid morning brunch catch up with friends. One of the hottest newcomers in town is Paddy Hills. Inspired by an Aussie style brunch cafe, Paddy Hills serve up beautiful brunch dishes and hand brewed coffee using Tiong Hoe Speciality Coffee Beans. The berry ricotta hotcakes are delicous, paired with summer berries, marscarpone and a generous drizzling of maple syrup. Over on Hong Street, Ronin is also a good option for an affordable brunch. They don’t have a huge menu but their French toast with grilled apples and bacon is a great option paired with one of their nicely brewed coffees. MET A Space Pod ($) A space capsule hotel – a solid option for budget travellers and backpackers. Naumi Hotel ($$$) A boutique hotel in the heart of Singapore. We loved Andre’s I wished I’d had more time to get to Waku Ghin, one of my friends recommended it too. You have so many of my favourites there! Waku Ghin is phenomenal. We interviewed Tets there, which was a highlight. I love Esquina and Tippling Club too. Sadly, didn’t have enough time to get to Burnt Ends. Next trip. And next visit I’ll also be making Long Chim a priority. Great little guide, Lisa!